News from LMCU: Refinancing now is one of the smartest moves you can make! Refinancing now is one of the smartest moves you can make! With LMCU’s guaranteed low mortgage rates**, we promise there’s not a better deal out there. For purchasing, refinancing or new construction, there’s no better place than Lake Michigan Credit Union. Call us at (844) 890-9767, visit LMCU.org or stop by any branch today. *APR=Annual Percentage Rate. Base rates are quoted, rates as of 1/20/15. The monthly payment for a 15 year schedule would be 1042.58 at an interest rate of 3.000%. This payment schedule is based on a $150,000 loan on a $200,000 property value. If an escrow account is required or requested, the actual monthly payment will also include amounts for real estate taxes and homeowner's insurance premiums. Your rate may vary depending on your specific credit terms and property analysis. Max Mortgage program. Rates subject to change. 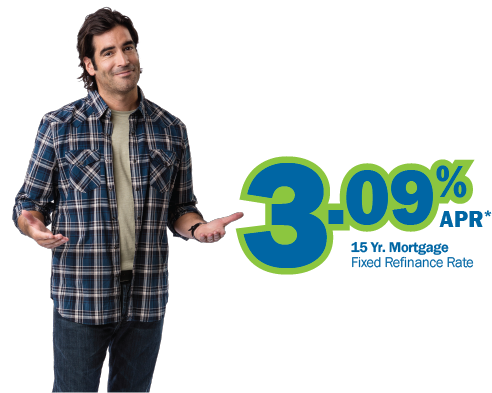 **Our Low Rate Guarantee: Lake Michigan Credit Union will match legitimate competitor offers or credit the borrower $300 off closing costs.